Dutton Books for Young Readers, 9780525452713, 48pp. Working in an American primitive style animated by the humor and storytelling genius for which he is renowned, Caldecott Winner artist Paul O. Zelinsky puts oils to cherry and maple for this tall-tale competition between a Tennessee woods-woman extraordinaire and a hungry, fearsome bear.Thundering Tarnation has a bottomless appetite for settler's grub. When word goes out about a competition to hunt this four-legged forest of stubble, a young woman, second to none in buckskin bravery, signs up. "How about baking a pie, Angel?" the other hunters taunt. "I aim to," says Swamp Angel. "A bear pie. "What follows is as witty a round of roughhousing as ever jostled the ranks of Americana. Anne Isaacs' original text unfolds in a crackling combination of irony, exaggeration, and bold image-making. Zelinsky's paintings respond with deft yet hilarious expressions, rhythmic shapes, and a sense of monumental motion, as benefits a heroine who can wield a tornado like a lasso, drink a lake dry, and snore down a forest. In the course of these grand shenanigans, the Great Smoky Mountains are stirred up, Montana's short-grass prairie laid down, and Thundering Tarnation's fate proves to have no less a reach than the starry heavens.Swamp Angel marks the debut of a promising new storyteller and adds to the tall-tale traditions a pictorial counterpart that will entertain and endure for a long time to come. 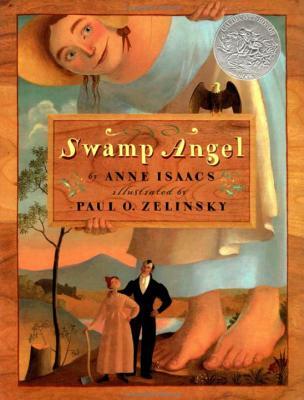 Also the author of Caldecott Honor Book Swamp Angel, Anne Isaacs was born and raised in Buffalo, New York.She feels most at home in rural environments such as the redwood forest near Santa Cruz, California where she lives with her family. Her husband and three children have built their own treehouse, which they share with several squirrels and blue jays. "All my life," says Anne Isaacs, "poetry has affected me more than any other genre. I have read and memorized it, studied it, loved, and written it since I was nine."Ms. Isaacs lives in Santa Cruz, California with her family. "It's a little surprising to me, when I think back over my childhood in suburban Chicago, and recall the things I liked and the things I did, that I never considered the possibility of becoming a book illustrator. During my elementary school years I was always collaborating with classmates to create imaginary worlds and the stories to take place in them and putting it all down in pictures. "In the third grade I drew bestiaries of ridiculous animals, their habits and habitats; in fifth grade my best friend and I, working through the mail, developed an island world of two competing countries. I think they were called Igglebeania and Squigglebeania (I know we never did agree about the spelling), and they teemed with colorful characters and important incidents. They now, like Atlantis, are lost to the world. At fourteen we wrote a novel about a monkey astronaut who saves the world from encroaching gorillas. Of course I made the pictures, and my friend's father took it on himself to send our opus out to real publishers for their consideration. It was with no small shock that several years ago, as I was leafing through my friend's scrapbook, I lit on a polite rejection letter from a publisher who was now a friend and with whom I had just published two books! "The earliest books that were important to me were, as far as I was concerned, not written or illustrated by anybody -- they just appeared in the library or in my room. The Color Kittens and The Tawny Scrawny Lion and many others that I can and can't remember filled my young childhood. It's the pictures that I remember, for the most part. "Some years later I had book heroes: William Pene du Bois and Robert Lawson were the most lasting. I especially loved The Twenty-One Balloons and The Fantastic Flight. It didn't occur to me that these writers were real people living in houses somewhere and doing real things. "Then a few years ago when I was driving in Connecticut with some friends they happened to mention that Robert Lawson had lived nearby. Inside my head, I jumped. Robert Lawson lived in a real place? In this world? Not having thought about it since my childhood, it seems I still harbored the notion that the man was just a paragraph on a book jacket flap. Now I guess that I, too, am taking a place on the back flap of book jackets. What the children reading my books will make me out to be, if anything, I can't guess. But it really doesn't matter: it's not the authors they should remember, it's the books. (Or maybe, for the most part the pictures!)" Known for his versatility, Mr. Zelinsky does not feel his work represents a specific style. "I want the pictures to speak in the same voice as the words. This desire has led me to try various kinds of drawings in different books. I have used quite a wide stretch of styles, and I'm fortunate to have been asked to illustrate such a range of stories."